Tom George, at Tom George Yacht Group, tells us that the Westport 34.1m motor yacht Missing Link has just been reduced in price. Built in 2008 as one of the yard's Westport 112 series, she features a crisp, contemporary cherry wood interior accommodating eight guests in four staterooms, and has been meticulously maintained with many upgrades. Twin 2000hp MTU engines give her a cruising speed of 12 knots. 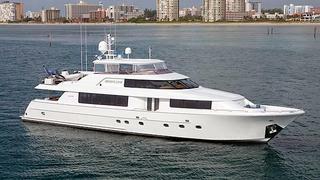 Never chartered, Missing Link is asking $8,275,000.